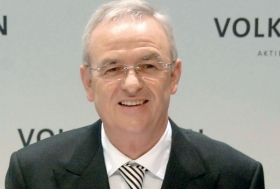 BERLIN (Bloomberg) -- Volkswagen AG CEO Martin Winterkorn said Europe's largest carmaker is set to grab the industry's leading position in sales and profitability from Toyota Motor Corp. after reporting surging results on demand in China. “The Volkswagen Group continues to have its sights firmly set on capturing pole position in the automotive industry,” Winterkorn said in a statement. VW is “well-positioned to achieve the goals laid down” for 2018, he added. VW's third-quarter net income rose 12-fold to 2.1 billion euros ($2.9 billion) as sales gained 18 percent to 30.7 billion euros, the carmaker said Wednesday. VW reported key nine-month group results on Oct. 22. Winterkorn has said he plans to surpass Toyota as the world's No. 1 automaker by 2018. VW internally aims to reach its sales goal of 10 million vehicles three years earlier than that, a person with direct knowledge of the matter said last week. Sales and profit are advancing as customers in China, VW's biggest market since 2009, buy Santana and Lavida sedans. VW's nine-month operating profit in China, the world's largest auto market, more than doubled to 1.32 billion euros. VW announced plans this year to add two Chinese factories, bringing the carmaker's total in the country to 11. VW is investing 6 billion euros to double production in China to 3 million vehicles within four years from 1.4 million in 2009.